The operational concerns associated with the high number of crossings create the potential for significant cathodic protection system issues for both operators. Cathodic protection is a necessary safety tool for natural gas pipeline operators to reduce and prevent corrosion of underground steel pipelines, which in turn results in reduced risk of leaks and anomalies. Many corrosion related pipeline leaks caused by cathodic protection system interference issues involve electrical current (DC) leaving one operator’s pipeline and travelling through the soil to the other operator’s pipeline. Electrical current typically takes the path of least resistance which in this case would be in the vicinity of the crossing points where the pipelines are within a few feet of each other. While parallel pipeline operators (with no crossings) each have an independent cathodic protection system that require separate mitigation plans and performance of corrective actions, the requirements exponentially increase with a high number of crossings, as proposed by Sabal Trail because of the increased risk of cathotic protection system interference. Maybe you want to mention this exponentially increasing risk of corrosion, leaks, and explosions when you ecomment to FERC and sign the petition to Georgia Governor Deal. Southern Natural Gas Company, L.L.C. (“Southern”) renews its request that the Federal Energy Regulatory Commission (“Commission”) convene a technical conference regarding the application filed by Sabal Trail Transmission, LLC (“Sabal Trail”) on November 21, 2014 in Docket No. CP15-17-000 to construct, own, and operate a proposed greenfield natural gas pipeline project (“Sabal Trail Project”). The Sabal Trail Project proposes to cross Southern’s pipelines numerous times over approximately 180 miles where the proposed greenfield pipeline would run parallel to Southern’s pipelines. On December 16, 2014, Southern filed a timely Motion to Intervene and Comments in this proceeding (“Comments”). 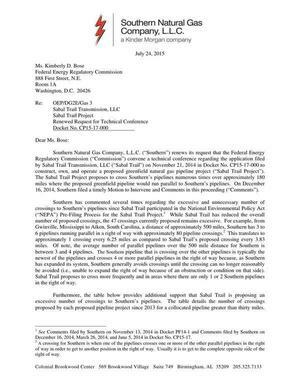 Southern has commented several times regarding the excessive and unnecessary number of crossings to Southern’s pipelines since Sabal Trail participated in the National Environmental Policy Act (“NEPA”) Pre-Filing Process for the Sabal Trail Project.1 While Sabal Trail has reduced the overall number of proposed crossings, the 47 crossings currently proposed remains excessive. For example, from Gwinville, Mississippi to Aiken, South Carolina, a distance of approximately 500 miles, Southern has 3 to 6 pipelines running parallel in a right of way with approximately 80 pipeline crossings.2 This translates to approximately 1 crossing every 6.25 miles as compared to Sabal Trail’s proposed crossing every 3.83 miles. Of note, the average number of parallel pipelines over the 500 mile distance for Southern is between 3 and 4 pipelines. The Southern pipeline that is crossing over the other pipelines is typically the newest of the pipelines and crosses 4 or more parallel pipelines in the right of way because, as Southern has expanded its system, Southern generally avoids crossings until the crossing can no longer reasonably be avoided (i.e., unable to expand the right of way because of an obstruction or condition on that side). Sabal Trail proposes to cross more frequently and in areas where there are only 1 or 2 Southern pipelines in the right of way. Furthermore, the table below provides additional support that Sabal Trail is proposing an excessive number of crossings to Southern’s pipelines. The table details the number of crossings proposed by each proposed pipeline project since 2013 for a collocated pipeline greater than thirty miles. 1 See Comments filed by Southern on November 13, 2014 in Docket PF14-1 and Comments filed by Southern on December 16, 2014, March 26, 2014, and June 5, 2014 in Docket No. CP15-17. 2 A crossing for Southern is when one of the pipelines crosses one or more of the other parallel pipelines in the right of way in order to get to another position in the right of way. Usually it is to get to the complete opposite side of the right of way. Sabal Trail’s proposed crossings on Southern’s pipelines is more than any other pipeline except for crossings with an affiliate. 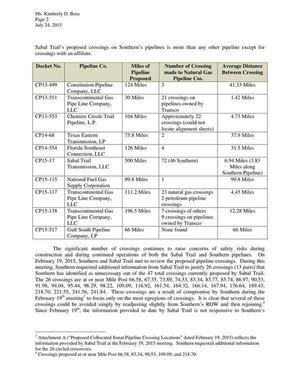 Number of Crossing made to Natural Gas Pipeline Cos. The significant number of crossings continues to raise concerns of safety risks during construction and during continued operations of both the Sabal Trail and Southern pipelines. On February 19, 2015, Southern and Sabal Trail met to review the proposed pipeline crossings. During this meeting, Southern requested additional information from Sabal Trail to justify 26 crossings (13 pairs) that Southern has identified as unnecessary out of the 47 total crossings currently proposed by Sabal Trail. The 26 crossings are at or near Mile Post 66.58, 67.35, 73.89, 74.33, 83.34, 83.77, 85.74, 86.97, 90.53, 91.98, 94.04, 95.44, 96.29, 98.22, 109.09, 116.92, 161.54, 164.32, 166.14, 167.94, 176.64, 189.43, 218.70, 221.55, 241.56, 241.84. These crossings are a result of compromise by Southern during the February 19th meeting3 to focus only on the most egregious of crossings. It is clear that several of these crossings could be avoided simply by readjusting slightly from Southern’s ROW and then rejoining.4 Since February 19th, the information provided to date by Sabal Trail is not responsive to Southern’s request to provide meaningful detail to support the proposed crossings.5 Sabal Trail has only provided additional information regarding the length for rerouting 3 of the 26 crossings: Mile Post 66.58 (adding 450 feet), 73.89 (adding 8,600 feet), and 74.33 (reducing the pipeline length by 750 feet). Therefore, the information provided on these three crossings supports Southern’s need for additional information in Southern’s efforts to collaborate with Sabal Trail. 3 Attachment A (“Proposed Collocated Sonat Pipeline Crossing Locations” dated February 19, 2015) reflects the information provided by Sabal Trail at the February 19, 2015 meeting. Southern requested additional information for the 26 circled crossovers. 4 Crossings proposed at or near Mile Post 66.58, 83.34, 90.53, 109.09, and 218.70. The operational concerns associated with the high number of crossings create the potential for significant cathodic protection system issues for both operators. Cathodic protection is a necessary safety tool for natural gas pipeline operators to reduce and prevent corrosion of underground steel pipelines, which in turn results in reduced risk of leaks and anomalies. Many corrosion related pipeline leaks caused by cathodic protection system interference issues involve electrical current (DC) leaving one operator’s pipeline and travelling through the soil to the other operator’s pipeline. Electrical current typically takes the path of least resistance which in this case would be in the vicinity of the crossing points where the pipelines are within a few feet of each other. While parallel pipeline operators (with no crossings) each have an independent cathodic protection system that require separate mitigation plans and performance of corrective actions, the requirements exponentially increase with a high number of crossings, as proposed by Sabal Trail because of the increased risk of cathotic protection system interference.6 Many interference bonds will likely have to be installed and monitored, continual rectifier/groundbed current output adjustments made by both operators, additional test lead stations for monitoring, and close interval surveys performed on a regular basis whenever changes are made to the other operator’s system. Moreover, ground disturbance around the existing pipeline increases the risk of damage to coating, which can set up a corrosion cell to the existing pipeline. Reducing the number of crossings would reduce the operational risks associated with the potential cathodic protection interference and outages. Because of the need for resolution regarding elimination of additional crossings on the Southern pipelines, Southern is convinced that a timely technical conference in this proceeding would be beneficial. A technical conference would provide a forum for both Sabal Trail and Southern to present information and develop the record in this proceeding sufficiently for the Commission to make the necessary findings. Negotiations cannot progress without the additional information requested by Southern to justify the excessive number of crossings. Southern appreciates the Commission and its Staff’s hard work and dedication. 5 See Attachments B and C for “Proposed Collocated Sonat Pipeline Crossing Locations” dated April14, 2015 and June 8, 2015, respectively. Information highlighted in yellow reflects updated information for the requested crossings from the February 19, 2015 version. 6 Federal regulations require that every crossing be monitored and inspected on an established interval if interference bonds are in place. See 49 C.F.R. § 192.465. 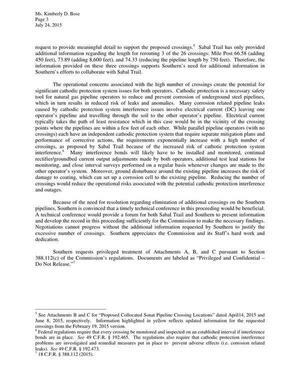 The regulations also require that cathodic protection interference problems are investigated and remedial measures put in place to prevent adverse effects (i.e. corrosion related leaks). See 49 C.F.R. § 192.473. 7 18 C.F.R. § 388.112 (2015). 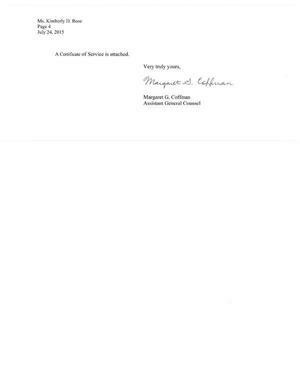 A Certificate of Service is attached.